Retail shop, pond services, fencing repair, handyman service. Free quotations, prompt and reliable, tidy and courteous, no job too small. All work carried out by the owner who has over 30 years experience. 10% discount for Gold Card holders. John was very helpful mending our fence which had been damaged in the high winds. He was punctual, polite, very helpful and responded very quickly to our telephone call. Highly recommended. Very pleasant man. Cleaned up after himself. Did an excellent job. They built a door and frame for us. Their work was very high quality, on time & a good price. Pleasant tradesman. Efficient and quick service. John did a great job helping us get our new house ready to move into. He arrived on time as promised and worked efficiently and methodically on a range of jobs. He fitted various types of blinds thoughout the house, as well as tackling curtain rails, shelving and mirrors. He was tidy, friendly and thoughtful and I would certainly recommend John to others looking for similar handyman services. Everything done methodically & cleaned up afterwards. Couldn't have asked for more. Good man. Recommend to others. Good quick job. �40 a bit pricey for 30 mins. A great service, we were pleased. Conscientious, very clean and tidy. Reliable and pleasant. Very satisfied with work done at a very reasonable price. John arrived promptly, worked efficiently and cleanly. Very pleased with the work completed and I will use him again. A prompt, reliable and competent trader. Very professional and kind. Good to have in your home. Trader came when he said he would & cleaned up after the job was done. John came (twice) on time and carried out an excellent job. Definitely recommend. Very nice respectable man. No faults at all. Rang John regarding leaking tap and he came within a couple of hours at the time he said. Job done quickly and efficiently . Used John before in the garden and a very tidy worker. John and Chris, the joiner, did an excellent job of replacing the front of our sun damaged garden shed. John is friendly and very professional, I highly recommend him for any handyman jobs you want doing. An excellent job completed promptly, efficiently, neatly and for an excellent price. Would definitely recommend and ask to do further jobs. John was very punctual, polite and discussed options available. From his initial visit the shed and other materials were available in a week and of high quality and fitted beautifully. Efficient, professional, friendly, very neat and tidy. Will use again - very impressed. A very polite respectful gentleman who knew what he was asked to do and completed the task very well. He was also helpful and knowledgeable. I would recommend him to my friends. Thank you. John carried out his works promptly, professionally & to the high standard we expected. We would definitely recommend to our family & friends. This is the third time we have used John to do some outside work for us - this time it was joinery in the porch. John is reliable, honest, hard working, always does a really great job and tidies up after himself afterwards! Cannot rate him highly enough and would strongly recommend. Excellent service I am a very pleasant person. Would use again without hesitation. John came to do a range of work on our pond in June last year, it had been neglected for sometime. He was so knowledgeable and enthusiastic bringing the pond to life with a range of plants, even introducing fish. The pond remains a highlight of the garden. Having seen him work we have just asked him to do a range of joinery jobs, adjusting wardrobe shelving, replacing defective floorboards and making a large Victorian door fit. Excellent work again by this very pleasant hardworking trader who we would certainly engage again. He also gave unbiased advise on certain other works. Very quick and friendly service. The work was first class and good value for money. We have used John several times, most recently to fit an outside warm tap to wash the dog after muddy walks. He's also sorted guttering problems and painted the conservatory. He's always reliable, prompt, friendly and takes pride in the quality of his work. I can't recommend him highly enough! John the handyman was very polite, hardworking, honest and friendly, he didn't rubbish or oppose what I wanted for my own home. He was open to different ideas for my garden and worked with me to come up with a unique retaining wall/fence. This man did a fantastic job. I had quotes for the work from �400-�1300 saying the roof needed a lot of work, he came and took a look said it was the guttering not roof, fixed it for less than �100 a fantastic job. I will have him again. 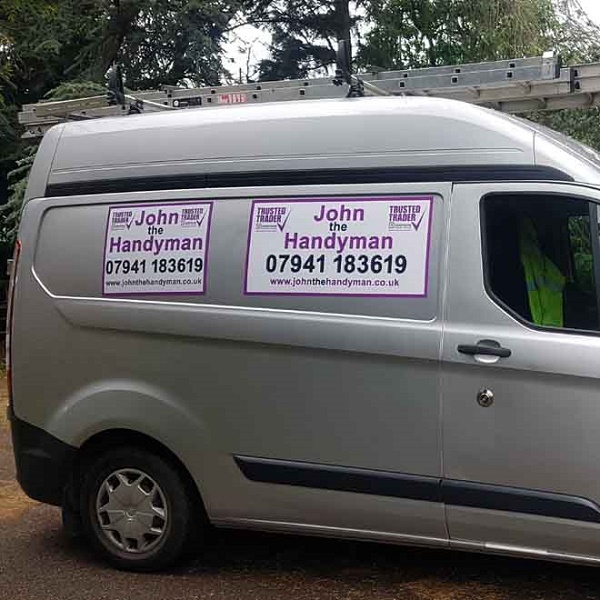 We came across John the Handyman by chance after seeing his Trusted Trader van and he has completed a wide range of household jobs my husband was unable to do. Very reasonable/efficient. Very reliable, hardworking and nothing is too much trouble! He is always prompt, capable, pleasant and helpful. Excellent - very clean, tidy. John is a very trustworthy person in whom you can have confidence. He gives good advice which leads to an effective solution(s). His knowledge of the subjects surrounding pond & all associated good maintenance solutions is very impressive. I can not recommend him highly enough. I have used John several times now for different jobs and have been highly satisfied every time. He is extremely reliable and does an excellent job at a very reasonable price. He is very polite and tidy. I would definitely recommend him. Very happy with work, price & person. Highly recommended. Excellent service as always. Highly recommend using John the handyman. The tradesman came to see the job within hours of contacting, measured up carefully then proceeded to get the job organised and cemented post in place with concrete to set for quite a time, returning the following p.m. to attach the leaning fence. All rubbish was removed leaving everywhere neat, tidy. Job well done! A real find, excellent work rate combined with a very good job done. John is friendly, trustworthy and capable individual. He does a good job. John is very artistic and made the garden border look very good. Arrived on time, job done as quoted, rubbish removed. Excellent work. John worked methodically, he kept everywhere very tidy and managed to get on well in our rather busy house. All the work he did for us was 'spot on'. We would definitely recommend him and use him again. Arrived promptly, worked quickly and efficiently. Cleaned up after himself would highly recommend! Excellent standard of work. Friendly, helpful chap. Very pleasant and capable person. John was very patient and thorough. The cistern replacement was more tricky than expected but John carried out the job efficiently and with minimal mess. He did not charge us this time but �5 for the job to be completed. Satisfactorily. I would recommend John to anyone needing a handyman. Well finished job in a very timely manner. Would recommend and use again. Came promptly and did a lot of work in an hour. Very professional. Turned up on time to quote, turned up on time to do the job. Completed a neat and tidy finish. Would have no hesitation in recommending John to anyone. Excellent, speedy & highly recommended. Clearly described what needed to be done and why. A very reasonable price was agreed before the work commenced. Extremely satisfied with the service. He did an excellent job. Very neat and tidy. Also he did extra work by chopping the hedge next to the fence. Chesterfield Aquatics know exactly how to service a commercial tank. Thoroughly recommended for price, professional and friendly responsive manner. John did exactly what we wanted, removing an old shed, clearing ground and erecting a new larger shed, for a very reasonable price. We will certainly use him again. Visited on time. Small job quoted for an undertaken the same day. Excellent service, would use again and would recommend.